So when someone bans you from a social media platform, is in fact by definition not violating first amendment rights. The bottom line being that a social media platform has 100% right to be able to silence you if they so see fit. Many people also believe the concept of "Not if it's hate speech." which is a different issue altogether. There are a lot of talking points in this, of which I would like to spend some time dismantling, discussing, and thinking about with a critical eye. "I support free speech but not if it's hate speech." While those who believe in this doctrine understand fully what they are advocating, it seems to be a bit blurrier than what is anticipated. Specifically the negative externalities that come about when someone says: "Not if it's hate speech." To give an idea, the first question that comes to mind when someone believes this doctrine is: "Who is it that is the absolute arbiter of who says something is hate speech?" Genuinely, there does exist the system of speech that in the context "can cause imminent and serious harm" which is labeled under by the Supreme Court as hateful. Instances of this would include a person who walks into a movie theater and yells "fire" to incite chaos. Additionally if something is considered hateful, it can be easily circumvented with additional speech. Those who would incite those to hateful content, and gaining attractors can be subverted entirely with your own speech. If someone says something you dislike, it is up to you to state your point with equal thought. By dismissing a point, or by actively silencing it creates the thought that they could be right. Or that you have a totalitarian propaganda to push. There is no defense with silencing the person because you consider that person without right to their own speech. Now do say that you go to a private property and start to yell out in a megaphone about the ills of a business. Because you are on physical private property, one could make the argument that they do not want you on their property. This is perfectly okay because private property rights effectively are enforced despite your right to free speech. Now in the event of a publicly subsidized college being a totally separate matter entirely. Specifically that because that institution is funded publicly (which colleges often are) if someone wanted to speak their mind, then by the rights of the 1st Amendment you have a right to your speech. Nobody is allowed to silence you with the only exception being that your speech "does not present as imminent danger to people." This is the same exact concept that currently exists with our current "technology" industry. However, being that the internet is free, (and by free, I imply that people are free to say their opinion without risk) people have the right to make their own platform. While nobody owes you a platform, certainly a platform of certain ideologies (namely Libertarian) would promote your freedom of speech, even if you would actively disagree with that opinion. (For example, a Libertarian blog platform hosting "pro-socialist" articles like this person here. Or people that advocate totalitarianism here.) With enough censorship, it would only be a matter of time before people tend to gravitate themselves over onto a platform that supports the 1st Amendment. While the common government solution is to "regulate big business" in, lets say, calling the tech industries that run social media platforms and treat them as utilities. Just as the telephone, electricity, water, et cetera cannot simply turn off your service because they do not like your ideology. This would in effect apply to the tech industry. But rather than simply chopping off the legs of the tech giants that would seek to limit the platform you are on, why not let the free market decide? Anyone can honestly make a website in which data cannot simply be removed and the database be backed up. So in the event someone wishes to de-platform you (Like an ISP, Godaddy, channels) then it would be a simple matter of migrating the SQL database and code to a new web service that could host you. Point being, this is the reason why this site exists. Regardless of political view, this is a platform that advocates the freedom of speech. It's the simple idea that anyone can make an article about anything without risk of censorship or persecution. Nobody owes you a platform, but the market will decide. 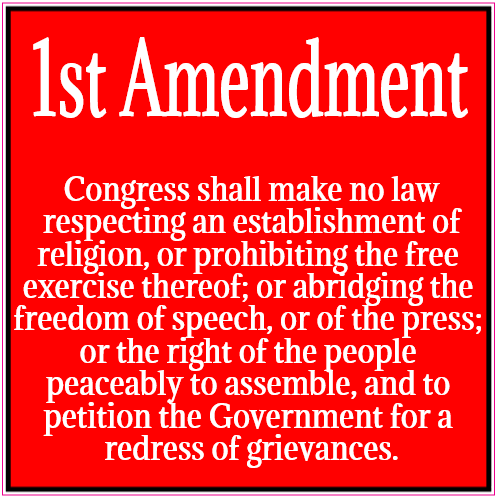 Nobody, no arbiter, political opponent, government are allowed to verifiably deny you your 1st amendment right. People may be able to take down my articles and even censor, block, shadow-ban, as much as they really want. Yet at the end of the day, the article is still there. The link is still there and nobody can take it away from you. Register today and immortalize your views for others to see.